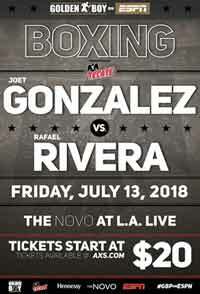 Review by AllTheBestFights.com: 2018-07-13, some good exchanges between Joet Gonzalez and Rafael Rivera, but it is not enough to get three stars: it gets two. The undefeated Joet Gonzalez entered this fight with a perfect boxing record of 19-0-0 (11 knockouts) and he is ranked as the No.49 featherweight in the world. In his last three fights he has beat Deivi Julio Bassa, Isao Gonzalo Carranza and Rolando Magbanua. His opponent, Rafael Rivera, has a record of 25-1-2 (16 knockouts) and he entered as the No.53 in the same weight class. He fought three times last year defeating Giovanni Caro and Ruben Tamayo but then he lost to Jo Jo Diaz (Joseph Diaz vs Rafael Rivera). Gonzalez vs Rivera is valid for the vacant WBO NABO featherweight title. Watch the video and rate this fight!